Should I stay in - or get out? Are you wondering if it’s time to exit that long-term position yet? Maybe it is time or perhaps it’s not, or maybe it might be prudent to just hedge that position with shorter-term plays in another account. But how will you know how to time these shorter-term speculative entries and exists? 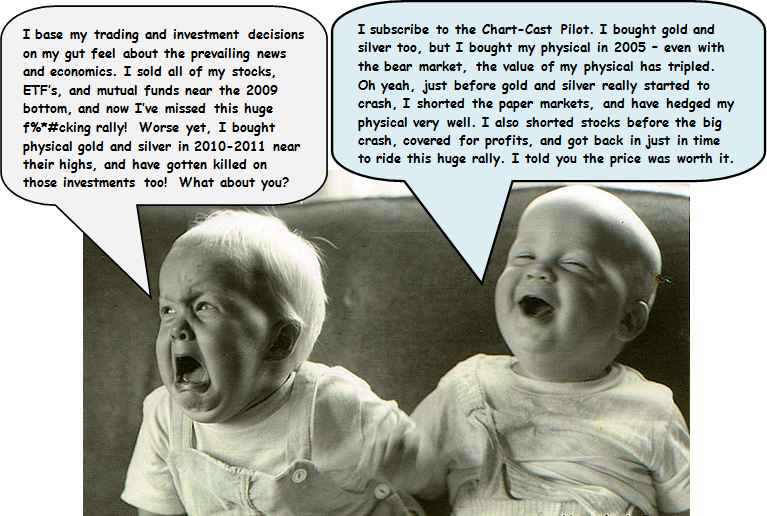 Well, thanks to Elliott Wave Technology’s Chart-Cast Pilot, you will never have to wonder about answering these questions and making those otherwise stressful decisions ever again. Not only will you get world class guidance for staying properly aligned with long-term trends until they quantifiably change, you will also get actionable guidance for properly positioning your ancillary trading accounts with the potential to capitalize on medium-term and short-term trends as well. In each timeframe and market, the Chart-Cast Pilot portfolio is never flat and thus always either long or short in every time-frame. To establish a long-term position bias, we use the underlying indices for the macro markets, and for the stock portfolio, we use long-term investment charts. We notify subscribers in advance via email alerts as well as through the daily publication dispatch as to pending position shifts for each market and timeframe. As such, subscribers are able to replicate precisely the performance of the long-term investment portfolio. To establish and monitor mid-level trading accounts geared toward the medium-term, the portfolio uses the appropriate ETF’s for engaging the macro markets, and to trade the stock portfolio, we utilize daily trading charts. We notify subscribers one session in advance of confirmed position shift alerts for each market. As such, subscribers are able to replicate precisely the performance of the mid-level portfolio. To establish and monitor short-term trading accounts, the portfolio uses the appropriate nearby futures contracts to engage the macro markets, and intraday charts to trade the short-term stock portfolio. We notify subscribers’ intraday via real time email alerts- one bar in advance (30-240 minute bars) of pending position shifts or short-term trend changes for each market. As such, in this case, subscribers are able to shadow vs. precisely replicate the general performance of the short-term portfolio. 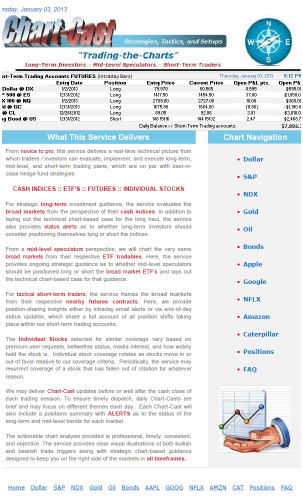 Each daily update includes the relevant chart and spreadsheet updates as to the ongoing performance and status for open positions within each market and timeframe. It’s that simple, and the results are rather effective. As such, there is no waiting for anticipated 3rd wave declines that never arrive, no long-winded thesis on the end of the world as we know it, no bullish or bearish table pounding, and no storytelling – all that remains are the charts and the trades, which plainly speak for themselves. The Chart-Cast Pilot is only $59.00 per month, which is a drop in the bucket relative to its profit history! You can take this multi-timeframe service for a 3-day test drive for just $5.99. If you don’t like what you see; just cancel within 3-days and you won’t be billed more than $5.99. Once you see the power and effectiveness of these multi time-horizon money-making opportunities, we’re sure that you’ll want to stick around for the daily updates and real-time alerts. 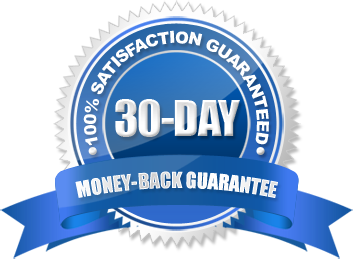 If you are not satisfied with this offer for any reason within the first 30-days of your subscription, just contact us for a full refund- no questions asked. Clicking on the buy-now button or the Chart-Cast Pilot link will take you to our member sign up page and then to the secure PayPal checkout page, where you’ll have the option to get these special offers using a major credit card or by using your PayPal account. Remember, you DO NOT need a PayPal account to take advantage of this offer. Yes, I’d like to sign up for the three-day trial offer on the Chart-Cast Pilot for only $5.99 for my first 3-days and then $59.00 each month thereafter.